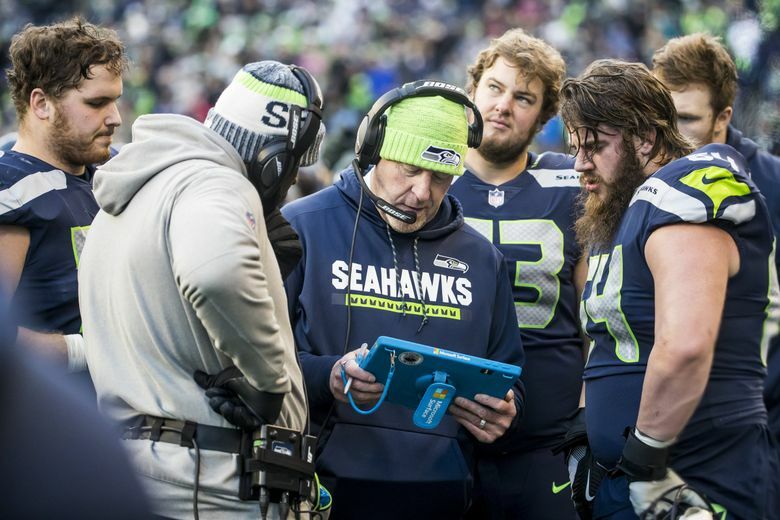 Tom Cable is out after seven seasons in Seattle, joining Darrell Bevell in coaches relieved of their duties as the Seahawks work to remake their offensive staff. The Seahawks on Wednesday fired offensive-line coach and assistant head coach Tom Cable, a source told The Seattle Times. The move is part of a decision by the team to revamp its offensive coaching staff in the wake of a 9-7 season that saw the Seahawks miss the playoffs for the first time since 2011. Cable was fired along with offensive coordinator Darrell Bevell, who was told Tuesday night he would not return. The team made the news of both changes official on Wednesday afternoon, announcing that each had been relieved of their duties. Cable has been with the Seahawks since 2011 and coordinated the team’s running game, working with Bevell to manage the offense. The Seahawks had unprecedented success with their offense and running game during much of Cable’s time with the Seahawks, setting a record with 2,762 rushing yards in 2014 when the team advanced to its second consecutive Super Bowl. That came a year after Seattle won its only Super Bowl with a 43-8 win over Denver. But the Seahawks struggled mightily to put together an effective offensive line the past two seasons, dropping to 23rd in the NFL in rushing in 2017, compelling Carroll — who will turn 67 next September and has two years remaining on his contract — to make a change. 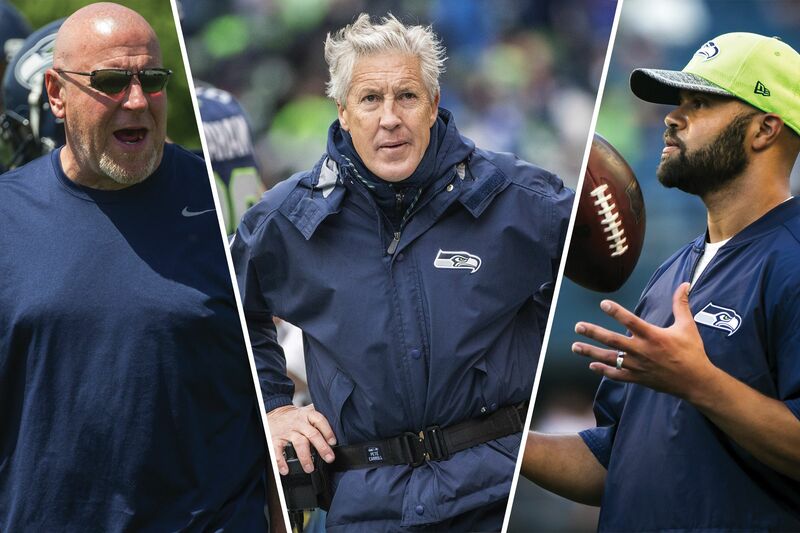 The Seahawks could undergo a complete overhaul of their top assistant-coaching leadership, as defensive coordinator Kris Richard also might not return. He is being encouraged by Carroll to explore other options, with NFL.com’s Ian Rapoport reporting that Carroll feels Richard could benefit from working in a different organization. Richard has worked only under Carroll as a full-time assistant, both at USC and with the Seahawks. Cable, 53, became a lightning rod for fan and media criticism of the offense the past few years, as Seattle struggled with consistency on the offensive line. Quarterback Russell Wilson often was under duress, and the running game was unable to find any consistent traction the past two seasons following the departure of running back Marshawn Lynch. Cable, who played at Snohomish High School, was hired by the Seahawks in 2011 after having gone 17-27 as coach of the Raiders in 2008-10. The firings are the first for a Seahawks coordinator since Carroll let go of offensive coordinator Jeremy Bates following his first season in 2010. The Cable-Bevell tandem arrived the next year. With the emergence of Lynch in 2011 and the arrival of Wilson in 2012, the Seahawks enjoyed some of the best offensive success in their history — in 2015 they set a team record with 6,058 yards. But the offense steadily declined the past two seasons, hitting a nadir in December with a 42-7 loss to the Rams and a 21-12 win over Dallas. The Seahawks gained 285 combined yards in the two games. That came after the Seahawks made maybe their most aggressive in-season trade of the Carroll/John Schneider tenure to upgrade the line, trading a third-round draft pick in 2018 and a second-rounder in 2019 to Houston for former All-Pro left tackle Duane Brown. The organization had accepted a certain amount of drop-off in the offensive-line play following the Super Bowl-winning season in 2013, as all five starters from that team were traded or not retained over the following three years. Veterans such as left tackle Russell Okung and guards James Carpenter and J.R. Sweezy were allowed to leave in free agency for salary-cap reasons. But the Seahawks also have drafted an NFL-high 16 offensive linemen since 2010, and it may ultimately have been the inability to produce enough quality linemen out of those picks that led to this week’s decision to turn over the offensive coaching staff. In his season-ending news conference last week, Carroll spoke frankly about the need for the team to get back to a run-first mentality. “There was issues during the season that, I think the big ones I would like to address for you is that we have a real formula of how we win, and we have been unable the last two years to incorporate a major aspect of that, and it’s running the football the way we want to run it,” Carroll said. “I think you see tremendous examples around the league of teams who have turned their fortunes around and they have turned it around in a formula that I think should sound familiar to you. But teams running the football. Teams playing good defense and doing the kicking game thing. That is the formula that has proven historically the best in this game. It will be up to a new set of offensive coaches to help Carroll get that done. Come back to seattletimes.com for updates.